There are several other colleges also taking part in the COMEDK UGET 2019. As per the norms set by the AICTE the minimum qualification for admissions into BE is 10+2 higher secondary or any other equivalent exam. The candidates must have been a resident of the state and has completed two years of study including subjects Chemistry, Mathematics and Physics along with English as a compulsory subject. For candidates belonging to the general category must have a minimum aggregate of 45% marks in Chemistry, Mathematics and Physics taken all together. For ST/SC/OBC the minimum aggregate is 40% in Chemistry, Mathematics and Physics taken all together. Candidates willing to appear for the COMEDK UGET 2019 can avail the information bulletin from COMDEK brochure from the official website. COMDEK UGET 2019 shall be held on 2nd May, 2019 and the application form for the BE course exam shall be available from 3rd week of January, 2019. The forms are to be available online only and can be filled online only from the official website of COMDEK. Candidates are required to fill the application form online and to take the print out of the application form and to send it to the registered office of COMEDK. A Demand draft of Rs.1300/ + GST-  drawn in favor of COMEDK from any of the nationalized bank payable at Bangalore for 3 subjects (PCM or PCB) has to be attached with the application form. Candidates are also required to attach the 10th and 12th board score card along with the pass certificate with the application form. The exam pattern for COMEDK 2019 shall be consisting three subjects carrying 180 questions overall and 60 question from each of these subjects; Chemistry, Mathematics and Physics. 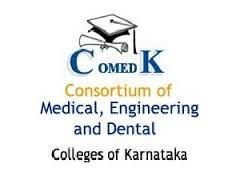 The Consortium of Medical, Engineering and Dental Colleges of Karnataka conducting the COMEDK 2019, have made the admit card available for the candidates willing to appear the entrance test. The admit cards can be availed from the official website of COMEDK by logging into their candidate account on the site. Chemistry: Chemistry of representative elements, nuclear chemistry, electrochemistry, chemical kinetics, chemistry in action, chemistry of biological processes, biomolecules, polymers, chemistry of carbon compounds, coordination chemistry, transition metals including lanthanides. Physics: Heat and thermodynamics, electrostatics, oscillations, thermal and chemical effects of currents, electromagnetic induction and alternating currents, physical world & measurement, introduction, description of motion in one dimension, description of motion in two and three dimensions. Mathematics: Vectors and dimensional geometry, matrices and determinants, coordinate geometry, exponential and logarithmic series, Probability, correlation and regression, differential equations, definite integral, integral calculus, differential calculus. Stage 1: Scores obtained by the candidates shall be published and the candidates shall be shown the total marks obtained by them in the entrance test in each of the subjects. Stage 2: The merit list shall be announced on June 2019 and the candidates shall be allotted the ranks on the basis of the scores secured by the candidates. The provisional answer key for the COMEDK UGET 2019 shall be published on 3rd week of  May 2019. The final answer key is shall be published on 4th week of May 2019 and the exam scores of COMEDK 2019 shall be published on last week of May 2019. The counseling procedure for COMEDK UGET 2019 shall be conducted by the Consortium of Medical, Engineering and Dental Colleges, Karnataka of June 2019 for the 1st phase of seat allotment to the eligible candidates. The counseling process shall be carried from a single window and the seats shall be allotted purely on the basis of merits, availability of seats and the reservation criteria. Authentication of the candidates shall be verified by the help of biometrics tests and photo identity match along with the signatures of the candidates shall also be verified. Candidates are required to bring any one of these photo ID proof in original and photocopies of driving license /passport /voter ID/pan card/Aadhar card/bank passbook. Candidates are required to bring the COMEDK UGET 2019 Admit Card issued to them by the authorities for verification purposes. Candidates shall also carry their class 10th and 12th board pass certificate for age verification purpose. Candidates need to  bring the mark sheets of 10th and 12th board along with the school/college leaving certificate. Candidates are also required to get a Demand Draft drawn on any nationalized banks in favor of “COMEDK” payable at Bangalore as the 1st installment of the fees and shall be adjusted from the annual fees at the time of admission. Candidates belonging to categories such as SC/ST/OBC etc are required to bring their certificates issued by the concerned authorities on the counseling day.